It’s that time of year when the trees around here are dripping with lemons and this recipe continues with the theme of ‘cooking with abundance’. What do you do with all of them? 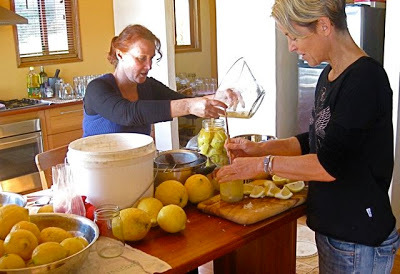 Well, you can start by making a few jars of preserved lemons – they are such a versatile addition to so many dishes – including the lamb, lemon and pea tagine that follows this recipe. NOTE: You don’t actually need the production line that we had – you can make a few jars at a time whenever you run out. 1. 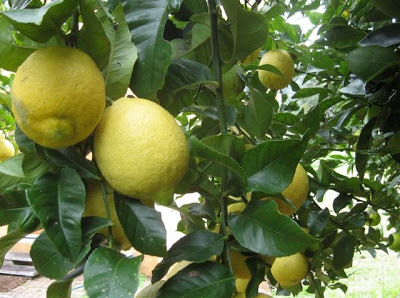 Wash and scrub the lemons and cut into quarters – lengthways. 2. Juice of lot lemons because you will need a few jugs full. 3. Put some salt in the bottom of a sterilized jar and start packing in the lemons – squash them in so there is little space between them. 4. Add some salt between each layer. 5. Fill to the top of the jar with quartered lemons and sprinkle with more salt. 6. Cover with lemon juice and tap a few times on bench top to bring air bubbles to surface. TOP TIP from Sharon via ancient wisdom. PLACE A CLEAN PEBBLE ON TOP OF LEMONS TO WEIGH THEM DOWN AND KEEP THEM BELOW THE LIQUID or they may go mouldy. 7. 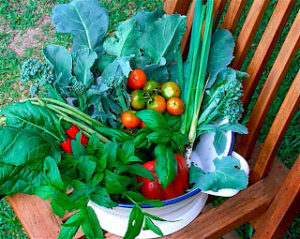 Leave in pantry until skin begins to soften – three weeks minimum. Will keep for up to two years. HOW TO USE THEM: Prepare by removing the fleshy part of the lemon (the fruit). Wash under cold water to remove the brine. Pat dry and slice the rind thinly. TOP TIP 1. from Linda, cook extraordinaire and owner of LuLu’s cafe. 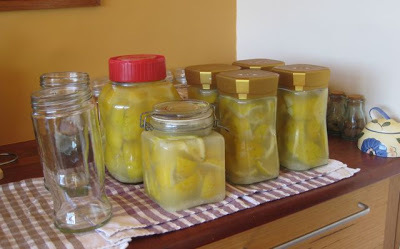 To speed up preserving process QUARTER LEMONS AND PLACE IN FREEZER OVERNIGHT BEFORE SALTING THEM THE NEXT DAY. The freezing starts to break down the cells and soften them. TOP TIP 2. from Linda, add a spoonful of honey, coriander seeds, cinnamon stick a couple of cloves to each jar. Thank you girls! 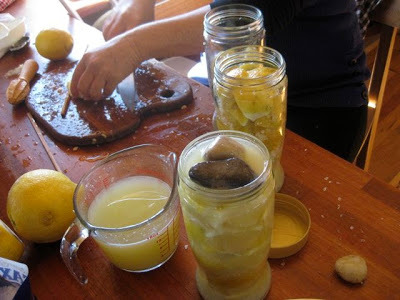 I had a wonderful morning, learnt a lot and have lots of lovely jars of preserved lemons. “No pleasure is worth giving up for the sake of two more years in a geriatric home at Weston-super-Mare”.